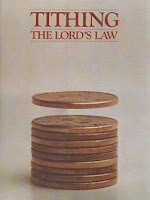 Our last quorum lesson was out of the Gospel Principles manual, on the topic of Tithing. This can be a very controversial topic. In fact, I understand that all Bishops are allowed to counsel is that the amount paid for tithing is 10% of one's "interest annually" or "increase". I don't believe they are allowed to counsel that tithing is paid from one's "gross income" or "net income". What I'd like to briefly present here is my own opinion on the topic. Again, this is my own opinion, and I won't be backing it up with any scriptural or General Authority references. "Gross income" is simple. What is the top line of your paycheck? What is your total salary? If someone is paid $10 an hour, and they worked 80 hours in a 2-week period, then their gross income is $800. If one were to pay tithing based on their gross income, they would pay $80.